For nearly a century after its founding in 1871, the National Rifle Association was among America’s foremost pro-gun-control organizations. It was not until 1977 that the NRA Americans know today emerged—after libertarians who thought owning a gun was the epitome of freedom emerged after staging a hostile leadership coup and fomented widespread distrust against government, if not armed insurrection. In the years since, the organization that once encouraged better markmanship and reasonable gun-control laws has given way to an advocacy organization and political force that saw more guns as the answer to society’s worst violence, whether arming commercial-airline pilots after 9/11 or teachers after the Newtown massacre, while opposing new restrictions on gun usage. It is hard to believe, but the NRA was committed to gun-control laws for most of the 20th century—helping, until the 1980s, to write most of the federal laws restricting gun use. The NRA was founded in 1871 by two Yankee Civil War veterans, including an ex-New York Times reporter, who felt that the war had dragged on because more urban Northerners could not shoot as well as rural Southerners. The NRA’s motto and focus was not fighting for constitutional rights to own and use guns, but “Firearms Safety Education, Marksmanship Training, Shooting for Recreation,” which was displayed in its national headquarters. The understanding of the amendment at the time focused on having a prepared citizenry to assist in domestic military matters, such as repelling raids on federal arsenals like 1786’s Shays’ Rebellion in Massachusetts or the British burning of Washington in the War of 1812. Its focus was not asserting individual gun rights, as today, but a ready citizenry prepared by target shooting. The NRA accepted $25,000 ($500,000 today) from New York State to buy a firing range. For decades, the U.S. military gave surplus guns to the NRA and sponsored shooting contests. In the 1920s and 1930s, the NRA’s leaders helped write and lobby for the first federal gun-control laws—the very kinds of laws that the modern NRA labels as the height of tyranny. The 18th Amendment, outlawing alcohol, became law in 1920 and was soon followed by the emergence of big-city gangsters who outgunned the police by killing rivals with sawed-off shotguns and machine guns—today called automatic weapons. In the early 1920s, the National Revolver Association—the NRA’s handgun-training counterpart—proposed model legislation for states that included requiring a permit to carry a concealed weapon, adding five years to a prison sentence if a gun was used in a crime, and banning noncitizens from buying a handgun. It also proposed that gun dealers turn over sales records to police and a one-day waiting period between buying a gun and getting it—two provisions that the NRA opposes today. Nine states adopted these laws: West Virginia, New Jersey, Michigan, Indiana, Oregon, California, New Hampshire, North Dakota and Connecticut. Meanwhile, the American Bar Association had been working to create uniform state laws and built upon the proposal, but made the waiting period two days. Nine more states adopted it: Alabama, Arkansas, Maryland, Montana, Pennsylvania, South Dakota, Virginia, Washington and Wisconsin. State gun-control laws were not controversial—they were the norm. 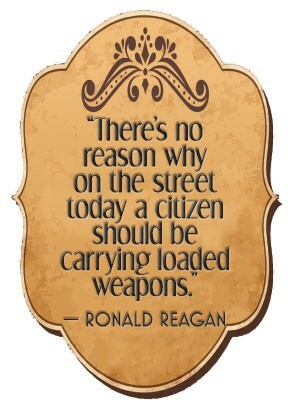 Within a generation of the country’s founding, many states passed laws banning any citizen from carrying a concealed gun. The cowboy towns that Hollywood lionized as the “Wild West” actually required all guns be turned in to sheriffs while people were within local city limits. In 1911, New York state required handgun owners to get a permit, following an attempted assassination on New York City’s mayor. (Between 1865 and 1901, three presidents were killed by handguns: Abraham Lincoln, James Garfield and William McKinley.) But these laws were not seen as effective against the Depression’s most violent gangsters. In 1929, Al Capone’s St. Valentine’s Day massacre saw men disguised as Chicago police kill seven rivals with machine guns. Bonnie and Clyde’s gun-crime spree from 1932-34 was a national sensation. John Dillinger robbed 10 banks in 1933, firing a machine gun as he sped away. That same year, new president Franklin D. Roosevelt made fighting crime and gun control part of his New Deal. The NRA helped him draft the first federal gun controls: 1934’s National Firearms Act and 1938’s Gun Control Act. These federal firearms laws imposed high taxes and registration requirements on certain classes of weapons—those used in gang violence, like machine guns, sawed-off shotguns and silencers—making it all but impossible for average people to own them. Gun makers and sellers had to register with the federal government, and certain classes of people—notably convicted felons—were barred from gun ownership. The U.S. Supreme Court unanimously upheld these laws in 1939. Perhaps the sportsmen of America could abide by the new law, but within the NRA’s broad membership were key factions that resented the new federal law. Thoughout the 1960s, there were a few articles in American Rifleman saying the NRA was waiting for the U.S. Supreme Court to declare that the Second Amendment included the right to own a gun, Joan Burbick recounts in her 2006 book, Gun Show Nation: Gun Culture & American Democracy. But in the mid-1960s, the Black Panthers were better known than the NRA for expressing that view of the Second Amendment. By 1968, however, Burbick notes that the NRA’s magazine’s most assertive editorials began saying that the problem was fighting crime and not guns—which we hear today. The 1968 law ordered the federal Bureau of Alcohol, Tobacco, Firearms & Explosives to enforce the new gun laws. In 1971, ATF raided the house of a lifetime NRA member who was suspected of having a large illegal-arms cache and shot and killed him. That prompted “the ardent reactionary William Loeb,” then editor of New Hampshire’s influential Manchester Union Leader newspaper, to call the federal agents “Treasury Gestapo,” Burbick writes, even though later evidence confirmed the weapons cache. Loeb and other white libertarians with podiums started to assert that the Second Amendment protected an individual’s right to guns—like the Black Panthers. But, of course, they were seeking to keep America’s white gun owners fully armed.